At GDC 2019, Google CEO Sundar Pichai unveiled Stadia, Google’s new game streaming service that has a mission of making gaming accessible to everyone throughout the world. Stadia uses Google’s data centers to handle the processing power, allowing you to game at 4K resolutions with 60fps on virtually any device you own, regardless of its own processing power. In fact, former Sony and Microsoft executive Phil Harrison took the stage to demonstrate this feature. Harrison showed off Assassin’s Creed Odyssey running on a laptop, then a phone, then a desktop, then a tablet, and finally a PC. That’s right, Stadia is compatible with PCs, tablets, smartphones, and TVs via Google Chromecast. Some TVs have Chromecast built-in, or you can buy the HDMI adapter. What’s more, you can pick up your session directly where you left off on a separate device. Similar to the Nintendo Switch, you can play on TV at home and then switch to a smartphone on the go. All USB controllers currently compatible with your devices will work with Stadia. That seems to suggest you will be able to use PlayStation 4, Xbox One, and Switch controllers to play games through the service. That is a neat addition that completely removes the need to buy additional hardware. However, the dedicated Stadia controller has its perks. The controller, which will come in black or white, takes the shape of the Xbox One controller but has the thumbstick placement of the PS4 gamepad. The controller has a capture button that lets you immediately share and save gameplay clips to YouTube either for yourself or for an audience. Streaming via YouTube allows you to record footage in 4K and 60fps. It also has an assistant button that will provide instant help with tricky parts of games, like finding the solution to a puzzle or where to go next. 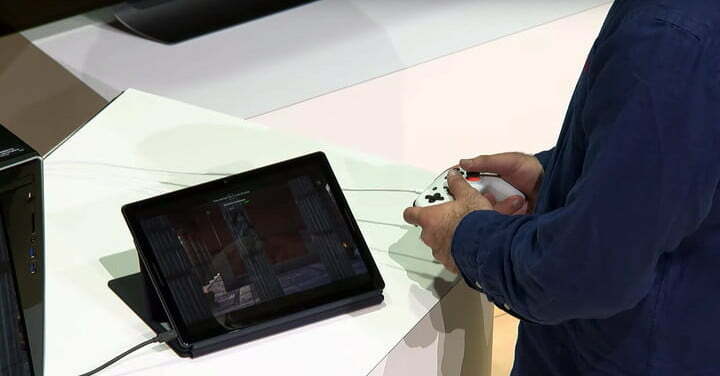 The Stadia controller connects via Wi-Fi to the data center, linking the controller to the screen you are currently playing on automatically. This could prove to be a welcome feature as opposed to re-syncing third-party controllers each time you switch devices. Stadia is the culmination of the Project Stream test featuring Assassin’s Creed Odyssey last year. Price details haven’t been revealed, but Stadia will arrive sometime in 2019.